Sandia Mountains, Albuquerque, N. M.
As seen at sunset with an early snow in winter. Coronado and his explorers were the first white men to see these mountains in 1540 and named them the Sandia or Watermelon Mountains. The altitude is 10,000 feet. Sandia Mountains East of Albuquerque, N. M.
The top of the Sandia Mountains (Alt. 10,678 ft.) is an hour’s drive from Albuquerque. From the crest can be seen a view of the Rio Grande River Valley for a hundred miles. 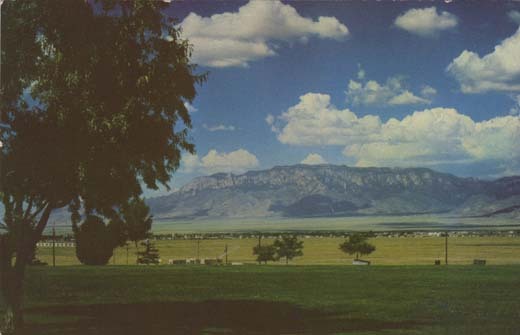 The Sandia Mountains offer numerous picnic spots, horseback riding, and hiking in Summer and all Winter sports in Winter. Sandia Loop and Rim Drive near Albuquerque, N. M.
Glints of Shining Gold are everywhere on this scenic road thru the tall and stately aspens. Loveliness is reflected from the hills in a wealth of exquisite color to the very crest of the Sandias. 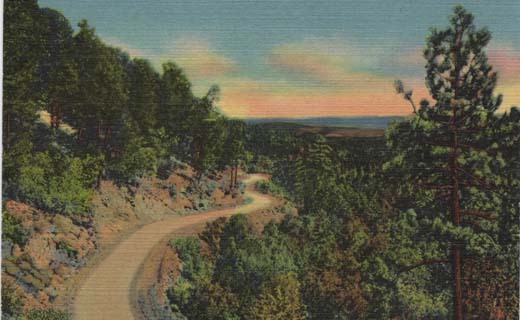 A magnificent trip and everyone visiting Albuquerque should take time out for this Rim Drive. Alfred McGarr Adv. 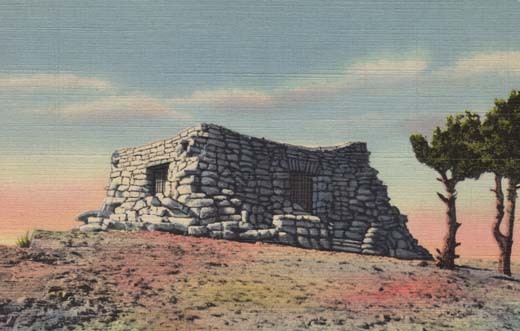 Service, Box 646, Albuquerque, N. M.
E. C. Kropp Co., Milw., Wis.
“From the Land of Enchantment”; Natural Color Post Card Mad in U.S.A. 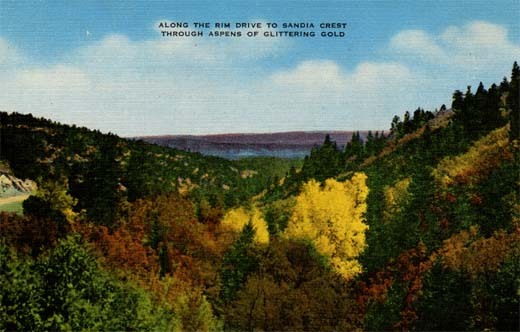 The scenic Rim Drive over the crest of the Sandia Mts. to Bernalillo is one of unsurpassed beauty and interest. 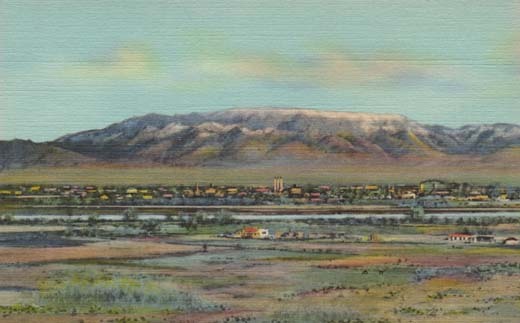 From the summit one has an unobstructed view for a hundred miles in every direction, the Rio Grande Valley, the extinct volcanoes, the city of Albuquerque, and to the north Bernalillo and several villages nestle in the foothills. To the west Mt. Taylor, 75 miles distant, dominates the scene on a clear day. 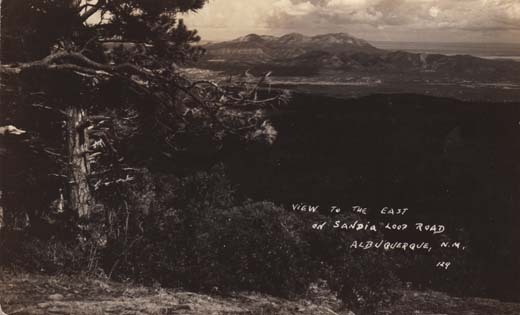 View from Kiwanis Point, Sandia Mountains, East of Albuquerque, N.M. This striking view is seen from Kiwanis Point which is reached on the well known Sandia Mountain Loop Drive. Altitude of Sandia Crest is 10,678 feet. Kiwanis Shelter House at Top of Sandia Crest, East of Albuquerque, N. M.
When making the famous Sandia Mountain Loop Drive, one finds at the top, this welcome shelter house. From its roof top, excellent views can be had of the far flung valleys to the east and west. Sandia Crest’s elevation is 10,678 feet. View to the East on Sandia Loop Road Albuquerque, N. M.
Lower loading station of Sandia Peak Tram, the longest clear and unsupported span in North America. 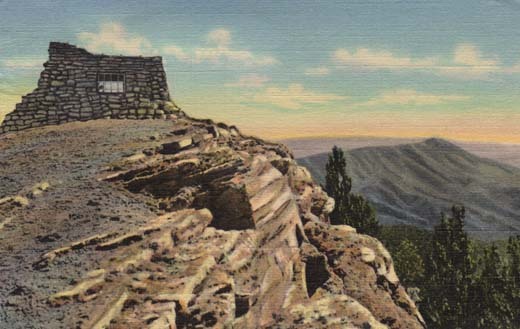 The 2.7 mile climb up the west side of the rugged Sandia Mountains is accomplished in 10 minutes, by two-60-passenger cars. 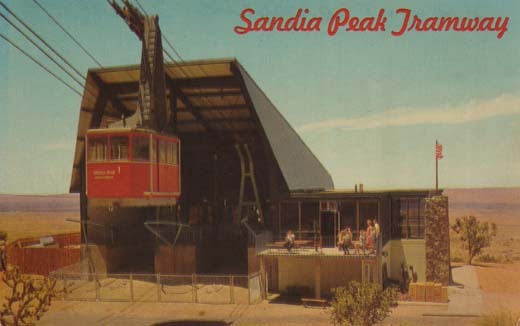 Watch the tram cars from the outside viewing deck, learn about it in the information center and curio center, then take a thrilling ride to the top.